Consider the third electron in a lithium atom. It is affected by the charge on the nucleus (+3). However it is also repelled by the charge on the inner two electrons. Electrons in the 1s orbital are much closer to the nucleus than any electrons in the 2s or 2p orbital. The two inner electrons in the 1s orbital screen the third electron from the full effect of the nuclear +3 charge. The difference between the full nuclear charge, Z, and the screening effect of the inner two electrons is called the effective nuclear charge, or Zeff. In general, for any many-electron atom, any particular electron will always be screened from the nucleus to some extent by the remaining electrons. 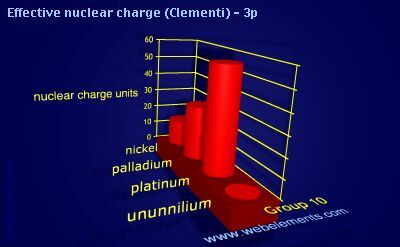 Image showing periodicity of effective nuclear charge (Clementi) - 3p for group 10 chemical elements. The numbers quoted here were calculated using methods known as "self-consistent-field" (SCF) calculations. E. Clementi and D.L.Raimondi, J. Chem. Phys. 1963, 38, 2686. E. Clementi, D.L.Raimondi, and W.P. Reinhardt, J. Chem. Phys. 1967, 47, 1300.